This fourth volume of Ralf's impossible objects series is a little bit of a departure in his methods. He is still not using any glue. However, all these objects have hidden cuts to make the illusions possible. 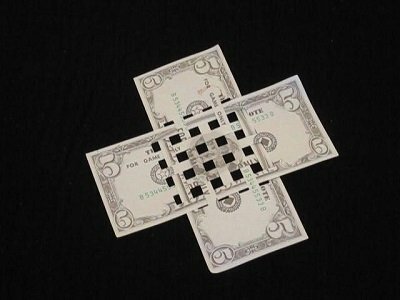 The "Interlocking Banknotes" can be handed out for examination. The other two need to be kept behind glass.